4.63 out of 5 based on 273 reviews. As mums, it can be distressing to see your baby’s eyes become red, crusty or weepy. Whether they have a cold, an infection or allergies, we want to do whatever we can to keep them happy little ones. 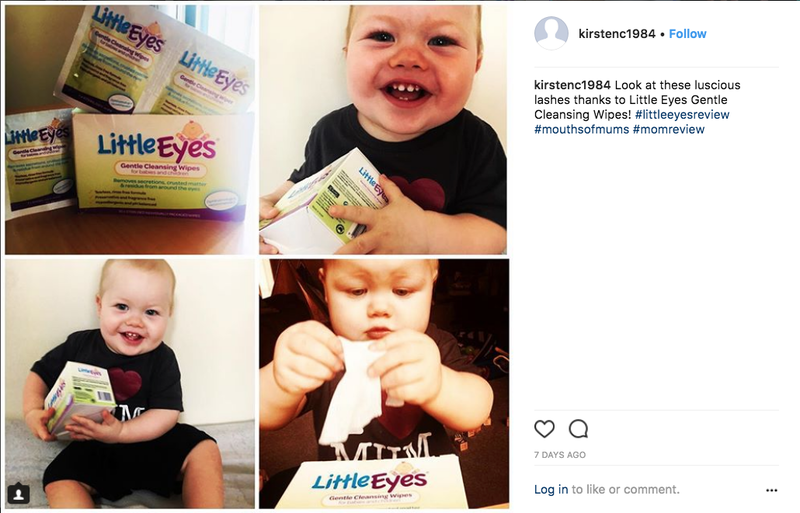 Which is why we are so excited to announce the Little Eyes® Gentle Cleansing Wipes Review! 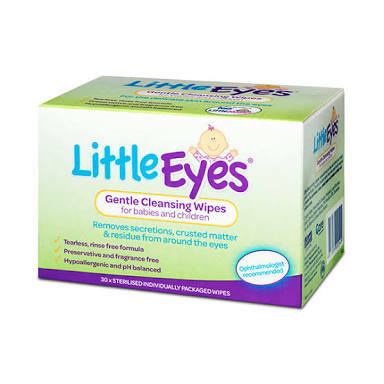 Little Eyes® Gentle Cleansing Wipes provide a gentle, convenient way to clean and refresh your baby’s eyelids and lashes. 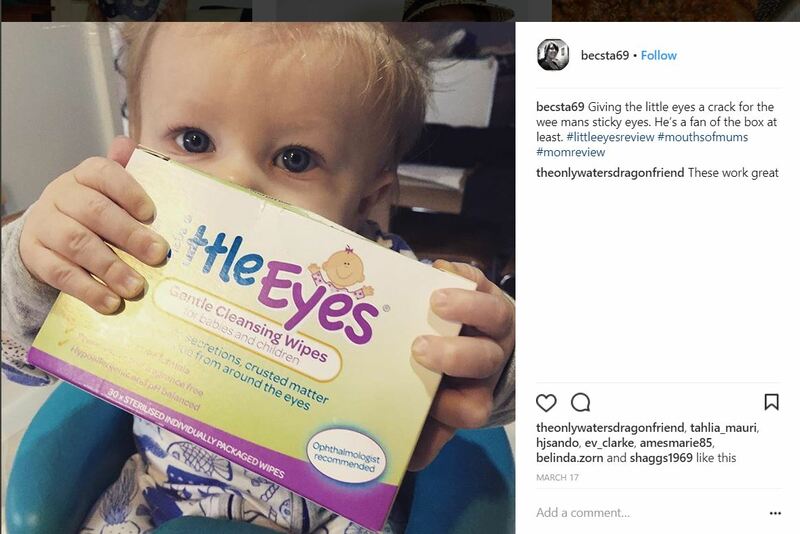 The soft, absorbent wipes have been specially designed to remove secretions and crusty residue on your bub’s eyelids and lashes. Little Eyes® uses a unique embossed technology which ensures every wipe is silky soft while remaining thick and strong enough to clean away any crusted matter. 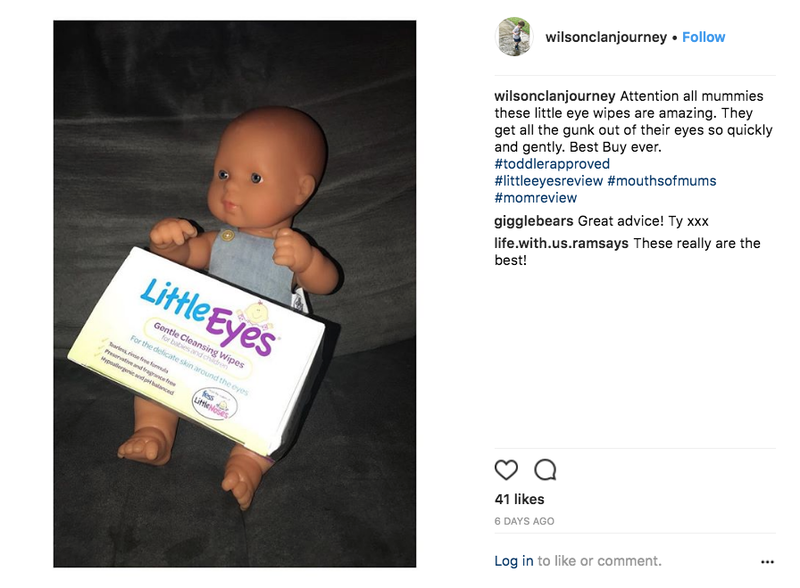 What’s even better is that Little Eyes® are tearless, rinse-free and individually wrapped so you can use it anytime and anywhere! 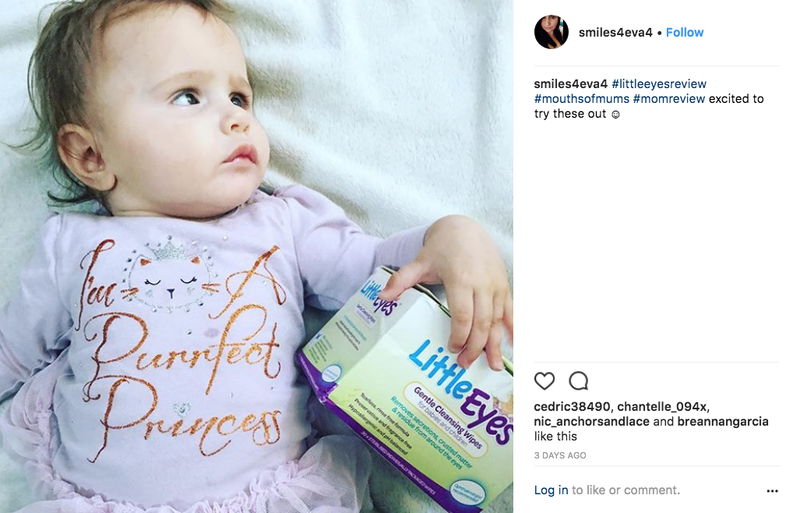 Common eye conditions among babies include conjunctivitis and blocked tear ducts, which can cause discharge resulting in sticky eyelids and crusty eyes. 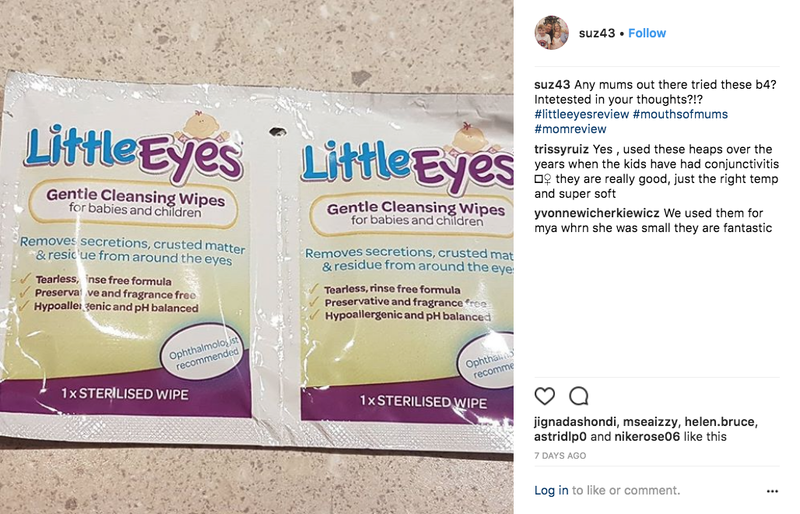 Little Eyes® can be used in conjunction with eye care treatments to gently clean the delicate eye area and remove secretions and discharge from around the eyes. Little Eyes® can also be used as a warm or cold compress. Use a separate sterilised wipe for cleansing each eye and use a clean wipe for each application. 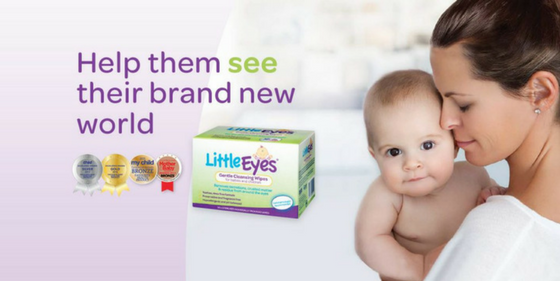 Tear open sachet and unfold the Little Eyes® wipe. Wipe from the inner corner of the eye (next to the nose) toward the outer corner. Use a clean area of the wipe so that drainage being cleaned away is not rubbed back across the eye. Take care to cleanse in between the lashes and sides of the eyelid. Do not wipe along inner eyelid. After use dispose of Little Eyes® wipe in a suitable container and then wash your hands. Where are Little Eyes® Gentle Cleansing Wipes available? Each box contains 30 sterilised individual wrapped sachets. Little Eyes® Gentle Cleansing Wipes are available at all major pharmacies. 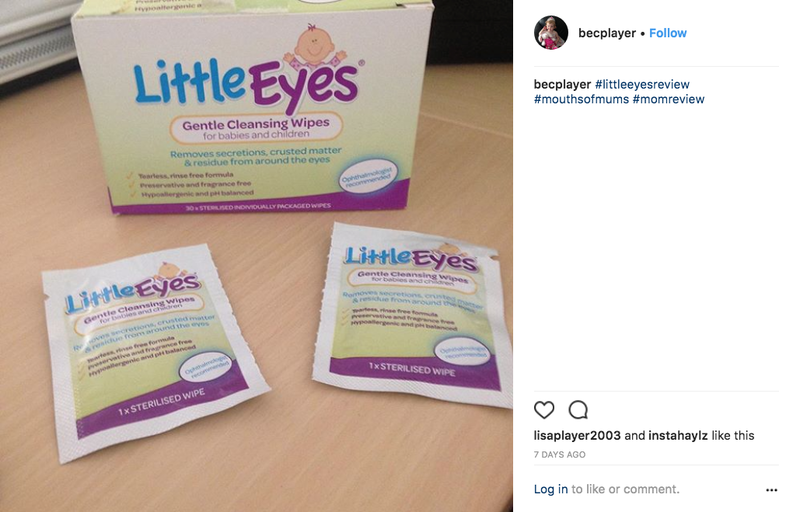 Find out more about Little Eyes® Gentle Cleansing Wipes. 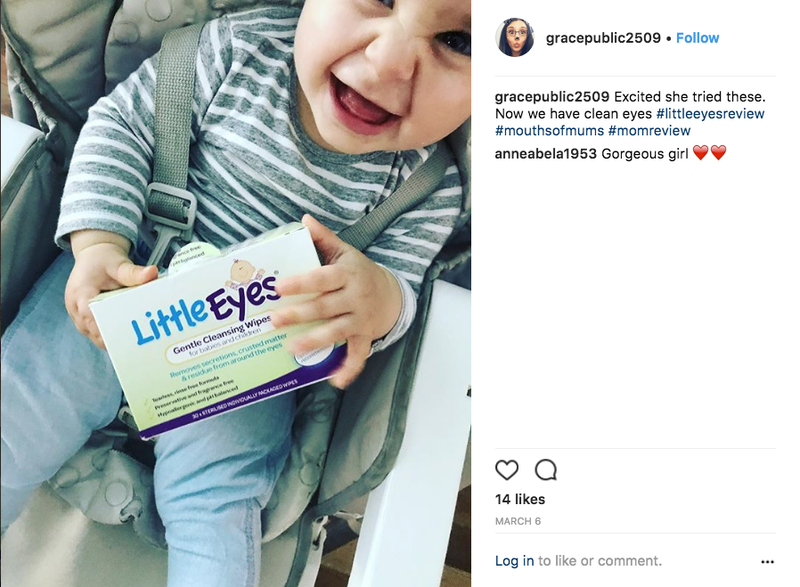 In the Little Eyes® product review we’ve sent Mums with bubs who suffer from conjunctivitis, blocked tear ducts or sticky/crusty eyes a pack of Little Eyes® Gentle Cleansing Wipes to trial at home. They’ll begin posting their reviews on this page once they’ve trialled and reviewed at home. 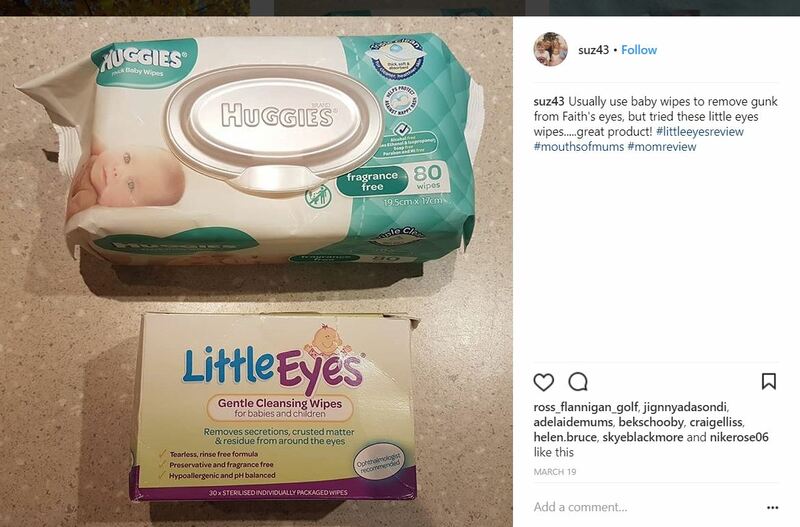 i have used little eyes for all 5 of my children and would use it if there eyes were a little gunky or just to give them a bit of a wipe. i love that they are in individual packs so that they can stay sterile and are also easy to transport in your nappy bag to use when ever you need them. 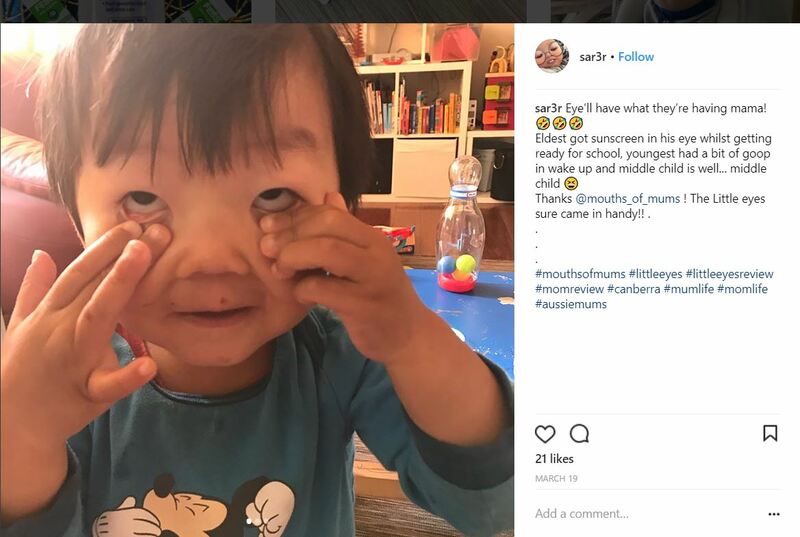 My 2 year old is often getting crusty eyes from daycare. 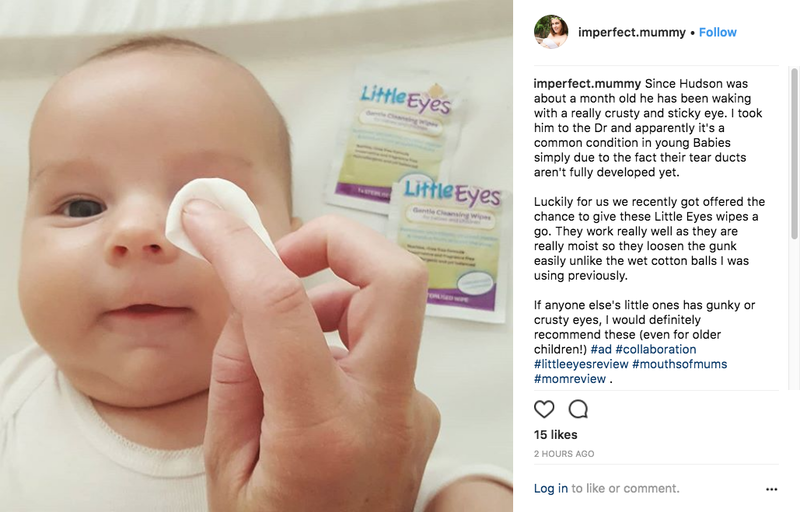 Using the little eyes wipes have made it easy to clean his eyes without any fuss or upset from him! I loved using them! Oh I love these for my little ones, always have some in my bag and baby bag. Honestly love this and it’s pain free. Cold season has come early for us and my little mans eyes are very gunky, little eyes have been a life saver as they make it easy to remove the sleet from his eyes. Very gentle and effective. The wipes are moist enough to dislodge the gunky mess, previously I used water and cotton wool which never seemed to move it. They are big enough for a few wipes. 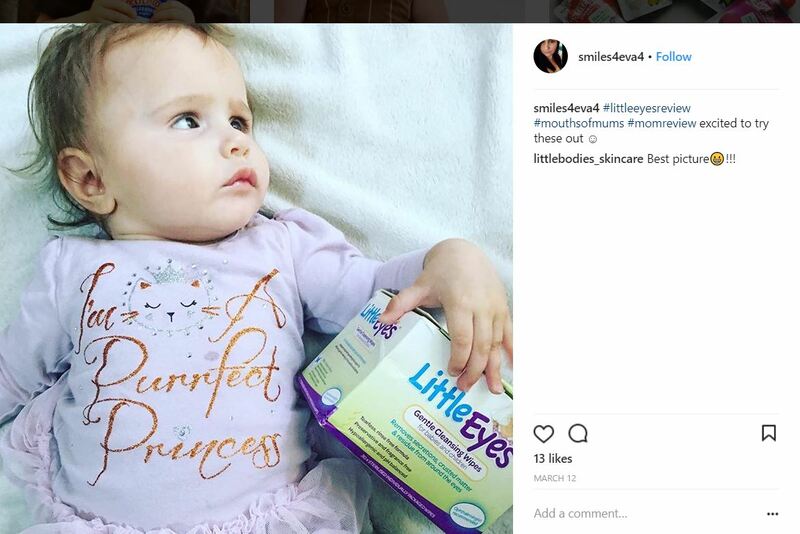 My little one has been sick with the flu and she has had very weepy yucky eyes and the little eyes wipes came in very good use. They helped to clear the gunk from her eyes and left the skin around her eyes nice and soft. I now keep the wipes in my handbag and nappy bag as i never know when ill need them. I highly recommend this product to anyone with a baby or young children. Thanks for making such a great product. 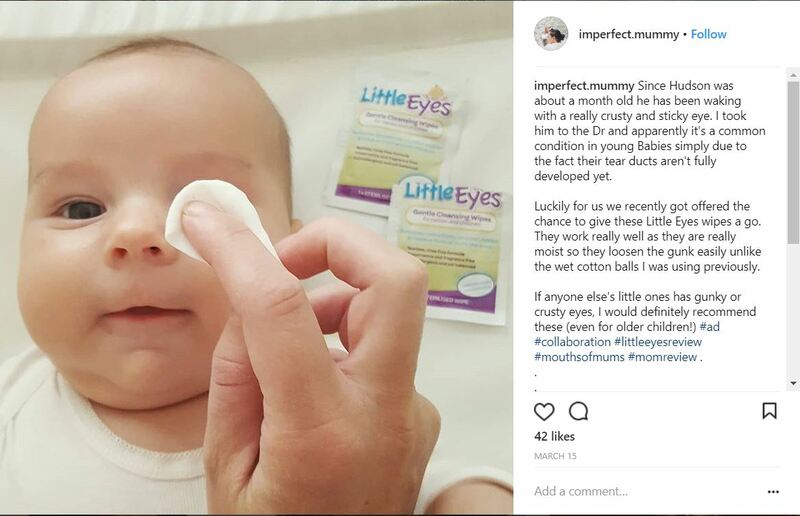 I was slightly sceptical at first because my daughter seems to have highly sensitive qld easily irritated eyes, however this product blew me away, not only is it simple to throw a few packs in the nappy bag to take everywhere with you. They also are extra gentle on little eyes, my older children and even my mums eyes! This is a must have product for anyone who has children and anyone with existing issues with eye discharge. I found Little eyes cleansing wipes to be great with my boys. They dont hurt their eyes, convenient in individual packs, have thrown a few in the hand bag as well. 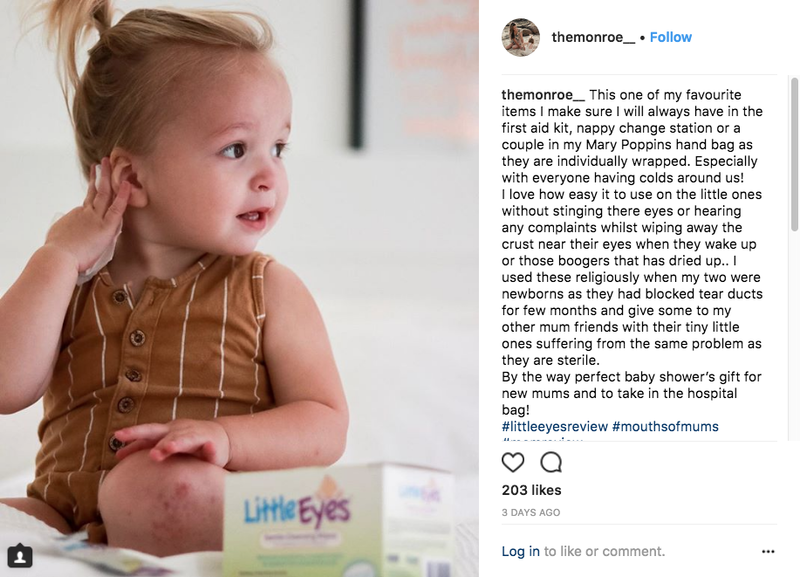 Tried these on my baby and they are fantastic! Got rid of the gunk and so gentle on her eyes. 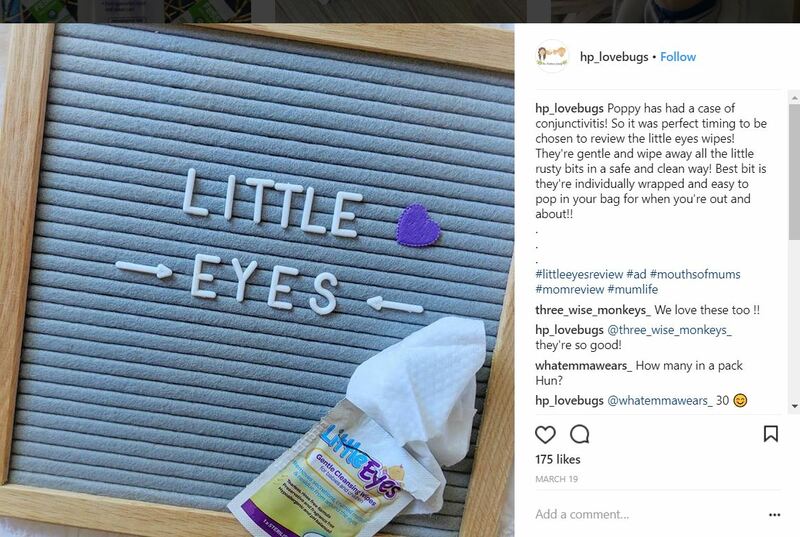 Little eyes is not only perfect for wiping away crusty matter or secretions, we use little eyes almost every day for wiping away any dried up food around Henry’s face after eating, it’s so gentle and has such a soothing effect. We also pack little eyes when we go to the beach for when Henry gets any sand into his eyes or salt water. The perfect all rounder! Absolutely love little eyes. I’ve used them on all three of my children. They are so soft and eye to use. No tears or fuss. I have been using these wipes for a few months on and off now and they are so gentle, they don’t cause any kind of irritation and they are so gentle. The best thing is that they don’t have any fragrance so they don’t hurt my little guys delicate and very sensitive skin. I have also used them for my allergy daughter when her eyes are sore and hurting to sooth them. I’ve always found this product to be great, especially for little ones during the winter months being more prone to congunctivitis. Whenever my children have had conjunctivitis I have always had little eyes on hand to wipe their eyes on the morning to help give them some much needed relief from all the hard crusts. Never have I had my children say that the little eyes hurt their eyes. Instead they have only been a blessing in those much needed times. 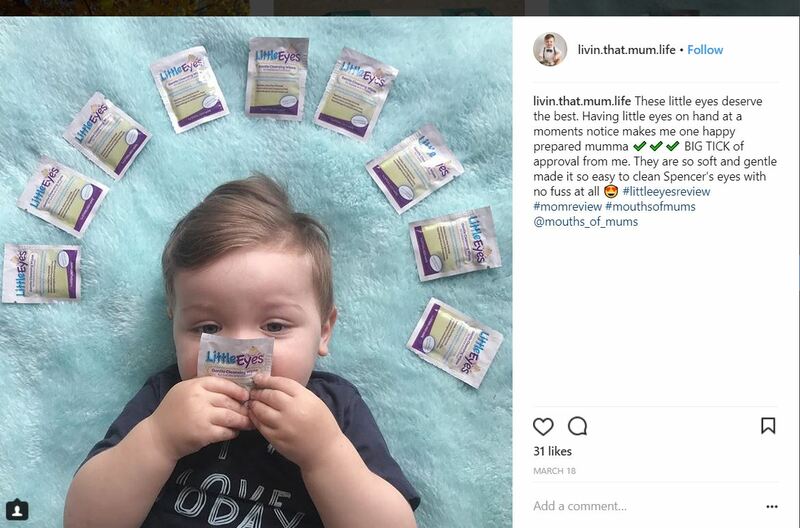 I would highly recommend this products to other mums and would encourage any mum out there to have a packet aside in the bathroom cabinet and you just never know when you’ll actually be relieved that you had some little eyes on hand. My little one has had crusty eyes so much lately. Winter and germs the likely cause. I was constantly wiping her eyes with tissues or picking at her lashes to get the little boogers off until I found these wipes. They are so effective and easy to use and so much gentler than anything else I use. A great product. I still carry these around in my bag and have used them for adults as well as babies and children. Super handy and sterile! One of my all time favourite products. Even have them in the first aid kit. This product is great for travel. So much easier than carrying around cotton balls and cool boiled water. 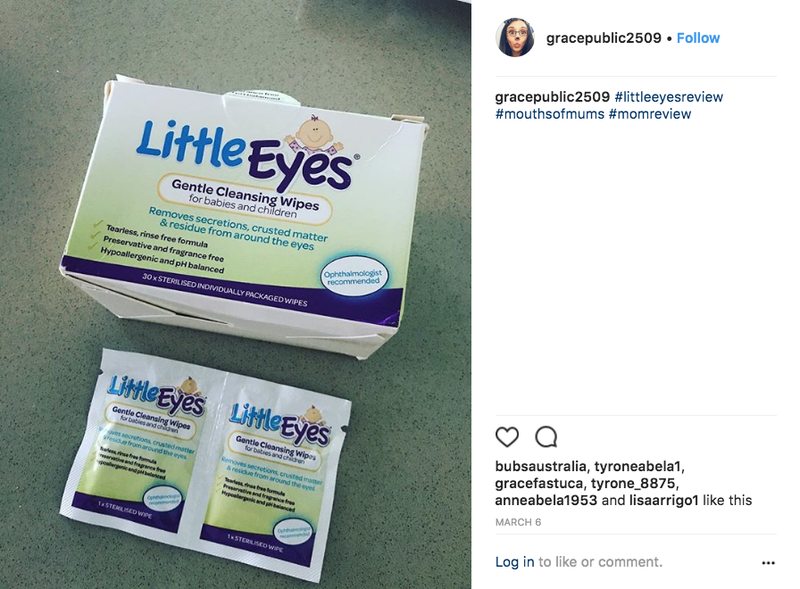 Little Eyes was easy to use and helped clear gunk out of eyes easily. I like that you can dunk the whole packet in warm water and that the wipe stays sterilized inside. I like this product and have it on hand just in case. 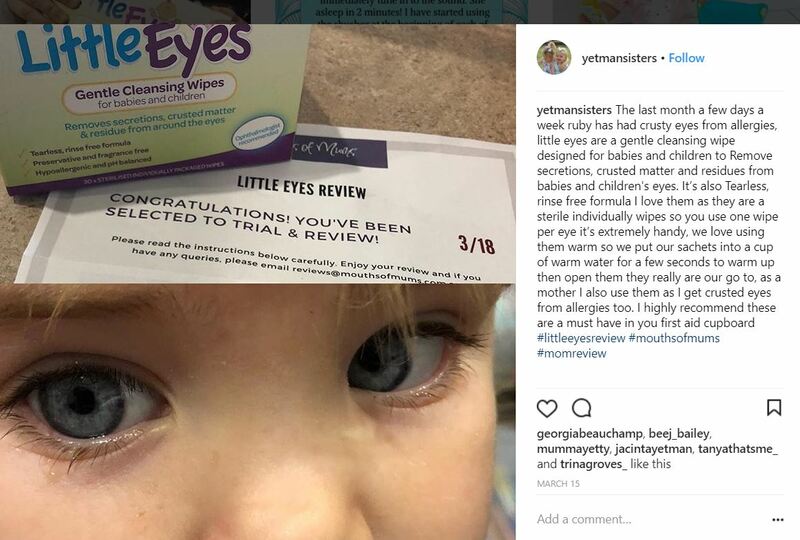 Little eyes wipes are an absolutely fantastic product. 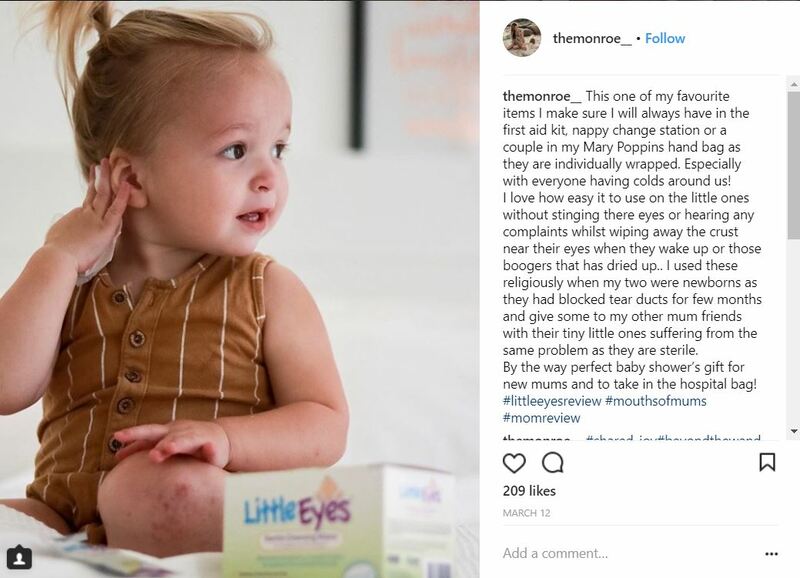 I received a sample of this product and was able to use it when my baby had a gooey eye from a blocked tear duct. It was really gentle on her eyes and cleared them up straight away. I think it would be a very useful product to have on hand. They conveniently come in their own little packs which are brilliant for on the go. 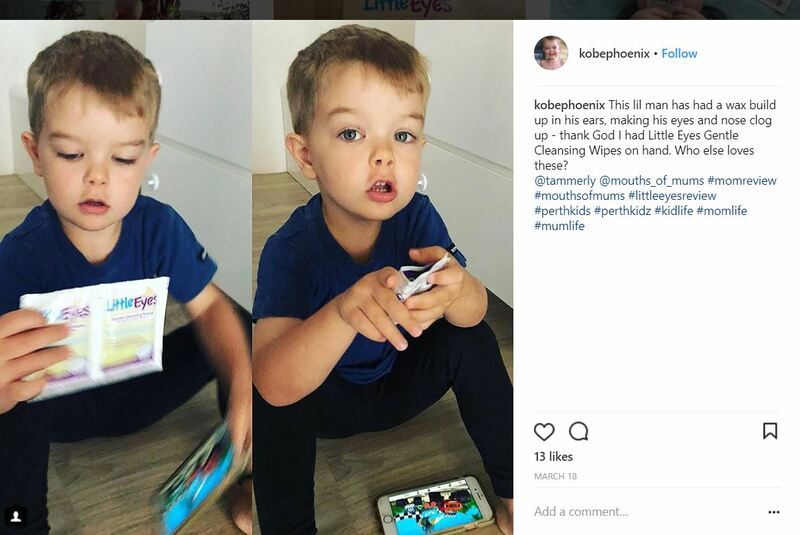 These little packets of two wipes are easy to open especially when you have a quick moving toddlee who doesn’t want his eyes wiped. They’re wet enough and soft enough not to hurt whilst cleaning their eyes. Having two separate packets are great for the hand bag for mum too when it’s windy and the hayfever starts. Great product if your kids get conjunctivitis.